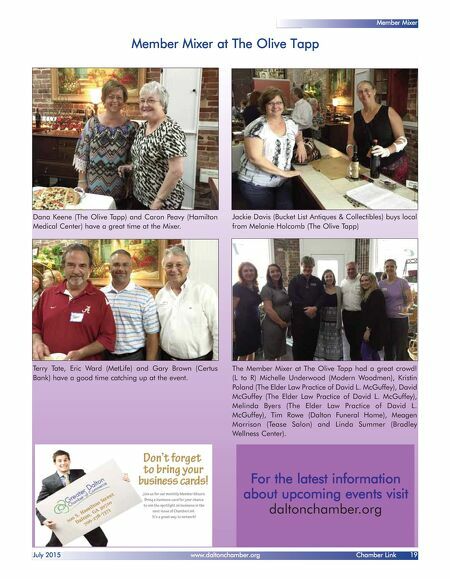 Chamber Link www.daltonchamber.org July 2015 18 Spotlight on Business What is the difference between a "Body Shop" and a "Collision Center"? For the most part, Body Shops deal with cosmetic issues, i.e., dents, scratches, etc. Collision Centers work with mechanical, electrical, drive train, air conditioning, SRS (supplemental restraint systems), structural design and integrity, corrosion protection, OEM -original equipment manufacturers - specifications, quality and appearance. A collision center is essential when you consider the fact that today's luxury vehicles can have 100 computers on board compared to the Apollo 11 space craft which boasted only a small handful of computers with less processing power than that of a common cell phone today. 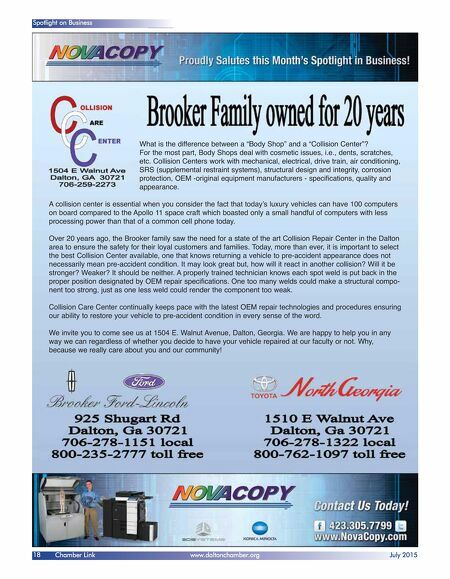 Over 20 years ago, the Brooker family saw the need for a state of the art Collision Repair Center in the Dalton area to ensure the safety for their loyal customers and families. Today, more than ever, it is important to select the best Collision Center available, one that knows returning a vehicle to pre-accident appearance does not necessarily mean pre-accident condition. It may look great but, how will it react in another collision? Will it be stronger? Weaker? It should be neither. A properly trained technician knows each spot weld is put back in the proper position designated by OEM repair specifications. One too many welds could make a structural compo- nent too strong, just as one less weld could render the component too weak. Collision Care Center continually keeps pace with the latest OEM repair technologies and procedures ensuring our ability to restore your vehicle to pre-accident condition in every sense of the word. We invite you to come see us at 1504 E. Walnut Avenue, Dalton, Georgia. We are happy to help you in any way we can regardless of whether you decide to have your vehicle repaired at our faculty or not. Why, because we really care about you and our community!